SCOTTSDALE | Perry Hood Properties, Inc. This Perry Hood Properties, Inc. 2 story floor plan has 4 bedrooms, 3 baths and a 3 car garage with approximately 3200 sq. ft. 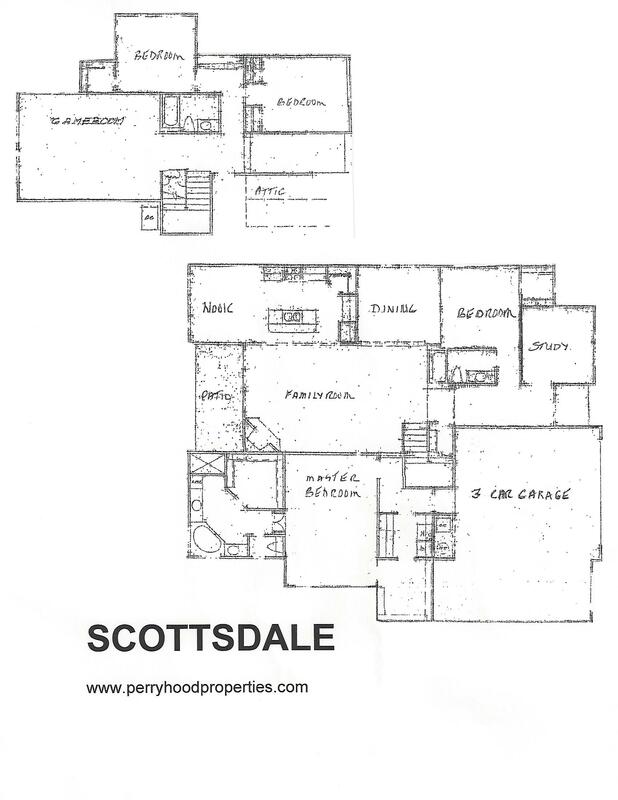 The Scottsdale features a formal dining room plus nook with covered patio accesss off the kitchen. Granite countertops, stainless steel appliances and lighted walk-in pantry complete the kitchen. Versatile game room upstairs. The large living room with corner fireplace makes for an inviting room for entertaining. The master bath as two vanities, a corner whirlpool tub, separate shower and two walk-in closets. Jay Rambo Co. cabinets through out. This plan has an option for a covered deck not shown. Ask one of our sales staff for more details and pricing.